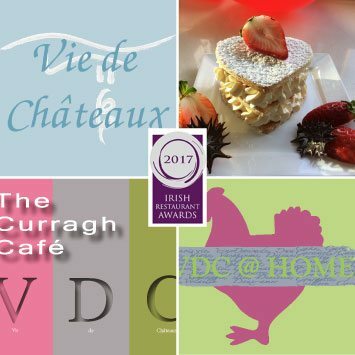 We have received notification from the Restaurant Association of Ireland that Restaurant Vie de Chateaux, VDC@The Curragh Café and VDC@Home were all nominated in one or more categories for this year’s Irish Restaurant Awards, the “Food Oscars”. We just want to extend a big “THANK YOU” to everyone who voted for us and also a big thank you to all our wonderful staff for working so hard to achieve this great result. We now go forward into the Leinster regional finals for the restaurant awards on the 1st March at Lyrath Estate in Kilkenny.